Husky® Portable Containment's Aluminum Quick Assemble AQUA Tank gives you the best of both worlds—a rigid frame AND portability. The AQUA Tank snaps together quickly and fits into its own storage bag for easy handling and compact storage. 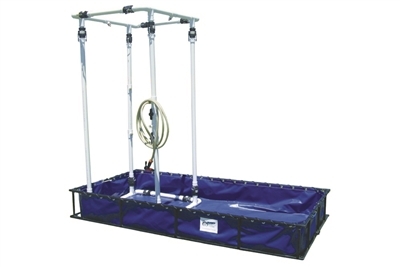 The rigid top (AQUA Tank Type I only has top rail) and bottom rails give the strength for throwing hoses over the top, no hose stand needed. The frame pieces are built from 6061 aircraft quality aluminum tubing. 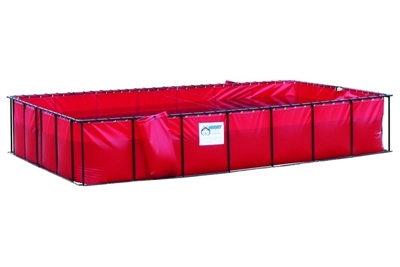 The corners are a slip in fit (Aqua Tank II & III) which, after the liner is installed, allows the top and bottom rail pieces to lock into place. No pins or wires to fight with and NO TOOLS NEEDED! Easy set up—it's a snap! 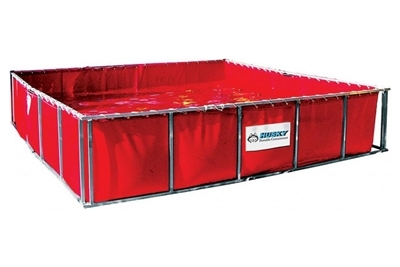 Husky® offers Double Folding Frame Water Tanks for the end user that has limited storage space. These unique frame tanks have a second folding point on the long side of the frame allowing you to fold the frame tank one more time cutting the overall length in half. Just pull the special heavy duty pins from the laser cut hinges and fold your tank again. The pins are secured to the frame to assure they will not be lost! Husky®’s new patent pending Leading Edge™ Tank is the multipurpose tank of the future. The LE Tank is built as a standard folding frame tank that can be transformed into a narrower tank. Our newly-designed frame allows you to take any size folding frame tank and partially fold one side creating a narrower tank that gives more options for set-up including back roads, which will allow traffic to pass without driving in the ditch. The good news is there is no assembly! It works just like a standard folding frame tank, but folds one more time. If you do not need the narrow-style tank, keep it as a full-size folding frame tank. You get the best of both tanks in one easy-to-use tank. Our standard fold-down dimension is 8" wide, our Skinny® Tank width, but we can create the tank to fold down to any dimension desired, just let us know! HUSKY® Self Supporting Water Tanks are the perfect solution when storage and manpower are a concern. 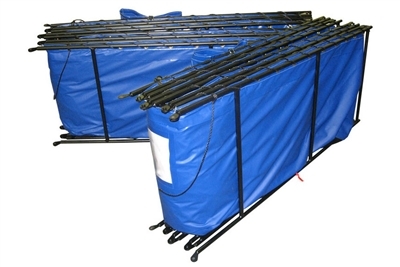 One man set-up frees up personnel, and because these tanks are frameless, there is no assembly required and they are easy to transport and store. Husky® offers low and high side models. 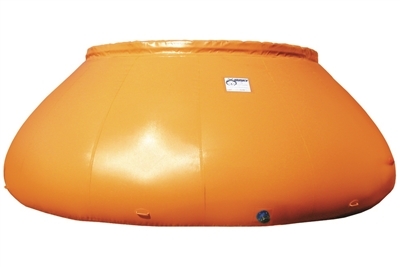 Most common sizes of our low side, self supporting frame-less water tanks can be quickly deployed and filled by one person. 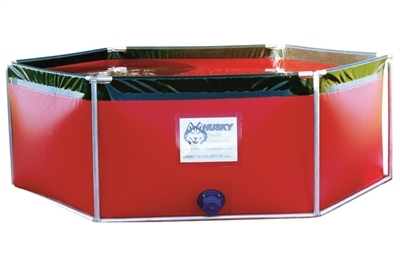 HUSKY® low side tanks may also be utilized as a dump tank. 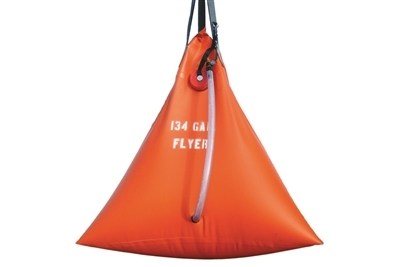 The heavy-duty foam collar will rise as the water level increases. 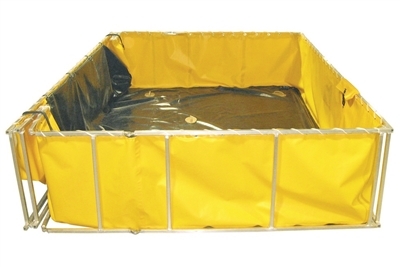 Husky® Portable Containment “Skinny® Tank” is a folding frame tank with a narrow design. This gives you other options as to where you can set up your dump tank. If you are on a narrow or one lane road for instance, the 8' wide “Skinny® Tank” allows access for your apparatus to get around the tank and not be forced into the ditch. It also gives better options such as in wooded areas with limited space or even between standing structures. 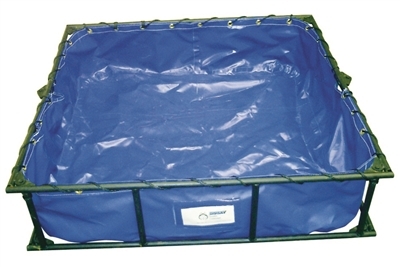 Husky's® port-a-tank liners are designed so there are no bulky corners or sagging liner. Our manufacturing process (patent pending) allows us to use one continuous piece of material for the side panel, which is then welded to our Husky®-duty floor material. We also install solid brass grommets in a tight pattern, alleviating any liner drooping at the frame. These features create the best fitting, most durable liner available.